Hair Vitalics is Belgravia’s one-a-day food supplement designed exclusively by our hair growth experts to maintain and improve the health and condition of your hair. They are available in Hair Vitalics for Men and Hair Vitalics for Women formulations in order to be as highly-targeted as possible. Find out more about how Hair Vitalics for Men or Hair Vitalics for Women can benefit hair health by clicking on the relevant buttons below. Or visit our hair loss treatment page to discover how hair growth boosters, such as Hair Vitalics, are used to complement – not replace – proven hair loss medications. 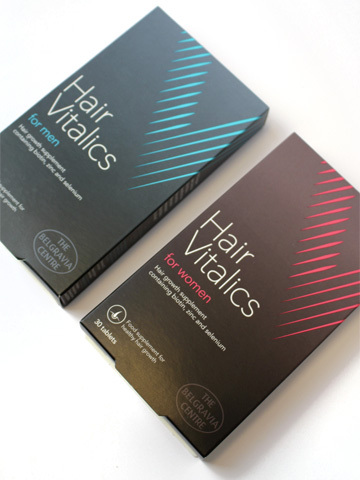 Hair Vitalics costs £25 for a 1 month supply, £10 off for a 3 month supply, 1 free box when ordering a 6 month supply or 3 free boxes when ordering a 12 month supply for non-clients who can purchase directly from the hairvitalics.com website. Belgravia clients receive free postage on their choice of Hair Vitalics when purchasing alongside almost all Belgravia’s hair loss treatment courses. Please contact Belgravia for more information. Click below to find out more about each of the Hair Vitalics hair growth supplements.